FILE - A Christmas tree is seen at the National Armory gun store on Dec. 23, 2015, in Pompano Beach, Fla. 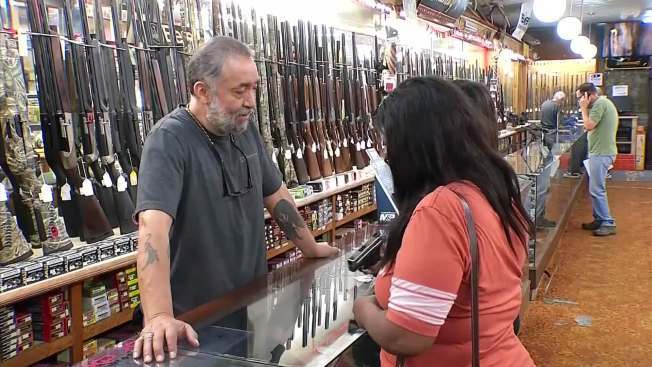 Fear of a crackdown following recent massacres in Las Vegas and Texas appears to be one of the reasons Black Friday was a banner day for gun buyers, with the FBI reporting a record 203,086 background checks for weapons purchases on the day after Thanksgiving, arms merchants and gun control experts told NBC News on Monday. Cargill was referring to the Nov. 5 mass shooting at the First Baptist Church in Sutherland Springs, Texas. It’s been documented that after major mass shootings, when politicians and others starting talking about gun control, gun sales go up, Daniel Webster, director of the Johns Hopkins Center for Gun Policy and Research, said.